Most bases have been covered for draft prep, but there is still a position out there, tight end. That’s right, even if you don’t draft Gronkowski you still have to fill that roster spot with a warm body. You might as well be prepared, so read on and see how you might be able to squeeze out the most points. Whether you swing for the fences or shop in the clearance section, you can still have success if you know your options. Even with Brady out for the first four games of the season, Gronk is still the premier name in dominating the tight end position. There are very few defensive players in the league that can match up with Gronkowski and even they cannot usually keep him quiet for a whole game. He is going to cost a high pick or a king’s ransom in auction dollars, but Rob Gronkowski is as close to a sure thing as you can get in football. The argument can be made for a couple of other guys, but I like Kelce for my number two pick. He is very consistent and also paired with a quarterback who loves short passes. Alex Smith is the king of game managing and Kelce is his duke of dump-off passes. Olsen has the full confidence of Cam Newton, but this year he will have a bit more competition for targets. I think that Carolina’s running game should be lackluster enough to force a decent amount of passing. This means that even with the return of Kelvin Benjamin, Olsen should still have plenty of chances to thrive on a weekly basis. 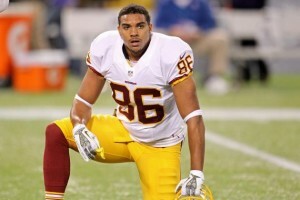 Jordan Reed is ready to roll, if he can stay on the field he will be big time. Kirk Cousins LOVES throwing the ball to Jordan Reed. This is great news aside from the fact that Cousins is not a great quarterback and Reed cannot always make it onto the field. Still the sheer volume of passes that will be thrown his way will result in a lot of nice stat lines for Reed in the games where he does manage to stay healthy. Another NFC East team with a good tight end; another quarterback that does not inspire confidence. Ertz has all the skill in the world, but it remains to be seen if Sam Bradford can regain his form as a serviceable NFL qb. There will be plenty of chances for Ertz to show off his skills so here’s hoping that Bradford can get him the ball on occasion. Walker has not been supremely consistent, but neither have most tight ends outside of the top 3 spots. He definitely can get separation and exploit mismatches. This year he will also have the advantage of a more experienced Marcus Mariota and a proven running back. The Titans’ offense will be improved and Walker will be a big part of that. Eifert can put up crazy numbers when A.J. Green doesn't gobble up the targets. On the days when Eifert and Andy Dalton are clicking, the two are a touchdown machine. 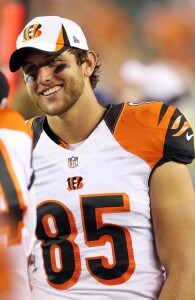 In any week, Eifert has the potential to win a fantasy matchup almost on his own. He also can disappear at times when A.J. Green or one of the running backs take over. Make no mistake, Antonio Brown is the star of the Steelers’ passing attack. This means that other teams will be game planning for him, however. As such, Green should have some room to run and he will finally be the featured tight end. This is a make or break year for Green, if he cannot produce at a high level then he might just be a bust. Barnidge showed some legitimate skills last season and opened a lot of eyes. My concern is that he flourished in large part when Josh McCown was at the helm. This season RG3 will be taking over and his favorite targets are yet to be determined. Gambling on skill can pan out, but Barnidge is far from a sure bet to repeat. This year will be interesting to watch for Coby Fleener as he has yet to really have a breakout season. After a couple of years playing with his college teammate Andrew Luck, Fleener now gets the chance to catch passes from Drew Brees. If playing with the future hall of famer cannot bring out the best in Fleener, then perhaps there is just not much more to see from him. So the preliminary copy of the draft rankings are now complete. Things are obviously subject to change, which is why having a draft a bit later can be a wise idea. Just ask anyone who drafted LeVeon Bell before yesterday. Be sure to go back and check out the other positional rankings and good luck in the draft.